Download your free app to your iphone or android today and enjoy tonight!! Clean drinking water is a huge concern no matter where you live during an emergency but for city dwellers it is more of a concern due to the amount of space needed to store water and also the inability to just walk to a river or stream to get more. Most just don’t have the space required to store the volume of water needed. This is a key reason I never recommend, in fact I strongly recommend against, storing dehydrated or freeze dried foods. Dehydrated foods need four times the volume of water to food to reconstitute. In other words for 1 cup of dehydrated food you need 4 cups of water. Now, you may be thinking freeze dried foods taste good without reconstituting but that is very dangerous. These foods need to be reconstituted to digest so if you don’t reconstitute them before eating your body will draw water from your cells for the digestion process. This leads quickly to dehydration and if untreated, to death. We talked about where to find space in the first post of this series. We talked mostly about storing food. When storing the foods we eat food=water. Think about it. As you use those peaches you can use the juice to cook your oatmeal or to reconstitute powdered milk. You can use green bean water to cook your pasta or to add to the flour for biscuits or bread. Collecting rain water is an option and should be considered in your planning. consider how you cold rig up plastic sheets, tarps, buckets, even a kiddy pool, to collect water. A small pool could be loaded with food and other supplies and slipped under a bed until it is needs. The rice stored in a 5 gallon bucket could be poured out into a pillow case and the bucket used to collect water. If you have a balcony this is much easier than if you don’t. Do you have access to the roof of your building? Could you work out a system with a neighbor across the alley to tie a tarp between your buildings? If you park on the street do you have a hard sided car top carrier that could be opened and allowed to fill with water during a rain? Purchase a water purifier. Some urban areas have lakes and rivers near by. You can not drink this water directly from the source so be sure you have a good water filter available. Remember it takes time to purify the water so you will need to be diligent. 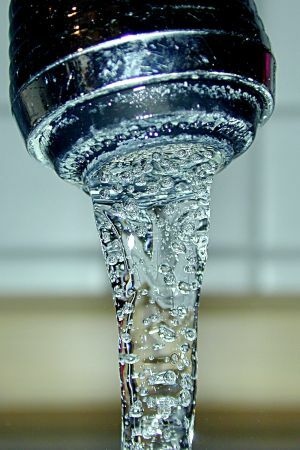 If you can get water but you do not have a purifier you can purify water in many ways (see your February Newsletter). One of the easiest in the city is to use clear plastic PET water, juice or soda bottles. Keep a few ready to go by removing the label, washing them with soap and water and rinsing well. Fill with clear water. If your water contains debris or dirt filter through a clean cloth first. Fill the bottle with clear water. Place the bottle on a piece of metal in the full sun, in 6 hours UVA radiation will kill viruses, bacteria and parasites in the water. If there is no sun then hopefully you are collecting rain water. On a cloudy day you will need to leave the bottle out for at least two full days. Think about your options today and walk around your home to case out the possibilities. Once you have done this it is time to purchase any items which will help you provide water during a crisis. The book Life As We Knew It was recommended to me a s book that depicts life after a disaster and as one that is a good conversation starter.